Are you feeling guilty after a boozy and fat laced festive period? If you are one of those people who now feels the need to actually attend that Gym you joined last year, but fear falling by the wayside again. 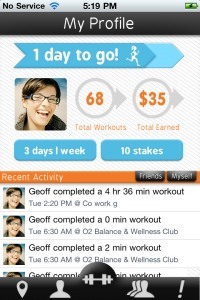 Then why not take a look at an innovative new application called Gympact. Gympact offers users a way of forfeiting money in exchange for absences from the Gym, essentially if you do not attend the Gym as you agreed in the pact, you will have to pay a penalty. And you need to check in at least 30 minutes for the agreement to register so no drive by check-ins for you. This penalty money is then allocated to those motivated individuals who spend at least 30 minutes checked in at their local gym as they intended to in their weekly pact, which is changeable, you can even have a rest if needed! Gympact is the idea of two ex Harvard university students and co-founders, Yifan Zhang and Geoff Oberhofer, who both attended an inspiring behavioural class while they were studying, they then started a 6 month trial of the idea in Boston at local gyms. This proved to be quite a success and other gyms across the states asked if their area could also be covered in the Gympact scheme. The idea for an application came as they realised that they could not scale as quickly as they would have liked partnering with other gyms, so the concept became a mobile platform app, allowing users to check into their local gyms using GPS on their iPhones. If you meet your goals you will be eligible to receive rewards from a collective pot of “naughty” money from those who made a pact but did not keep all or part of it. Gympact will take a 3% cut of the transactions. It appears that even the Groupon CEO Andrew Mason has picked Gympact as one of his favourite companies while attending a pitch contest in Santiago. I have to say that this application does seem to have blended a good deal of issues that could help motivate people to get off their backsides and go to the Gym. Instead of the old badge points and rewards affair nonsense, this application actually gets right down to the bottom of it all and penalises where it hurts, in the pocket. It also rewards you in the best possible way and helps line that pocket if you are a good “Gympacter”. So where is the proof that all this works? Gympact claim that users are going to the gym around 80-90% of their agreed time in the pact, and only a $5 commitment is enough to make people actually go to that gym a few times a week or fear losing some of that hard earned cash. With a very small cash payment for being good, it is not really about getting paid to go to the gym, but it is a nice incentive to have rather than nothing, and working with the penalty system, it does nicely bring home the benefits of getting to the gym.